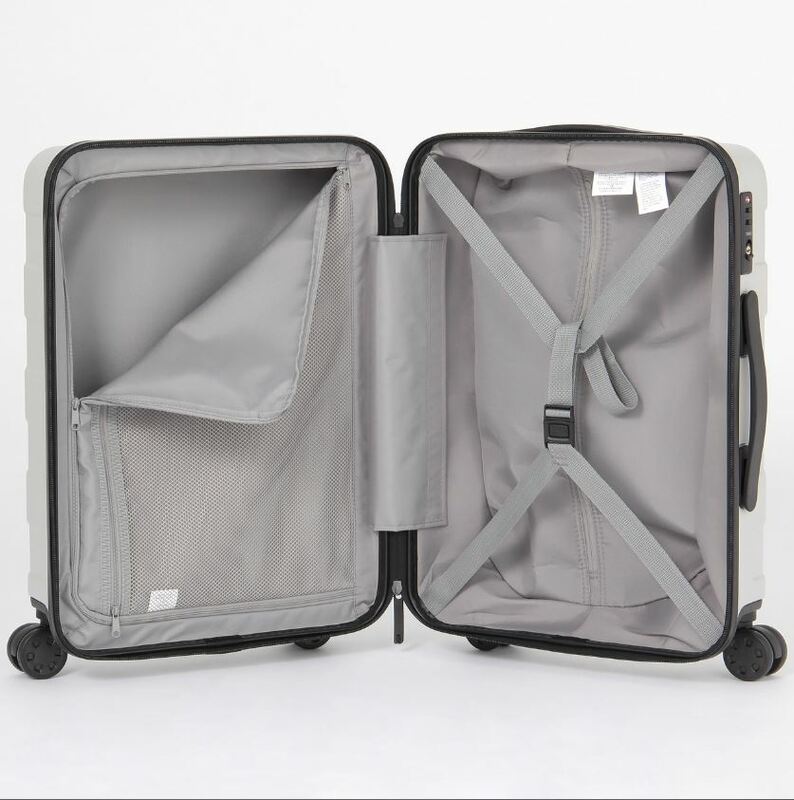 Muji Suitcase review: new 35 liter and 19 liter spinner luggage! I don’t normally use a roller bag for travel, preferring a carry-on only backpack, or if I do need to check something, I usually favor checking a carry-on sized duffel. But there are times where a suitcase is worth it. Here at UrbanCarry, we may harp on all the benefits of a ‘carry-on only, no-wheeled luggage’ way of traveling, but we don’t deny that rollers have their place. For a lot of travelers, it may be the most efficient way of getting from point A to point B. For an urban vacation, where you’re mostly going airport-taxi-hotel, it’s perfectly fine. Rolling luggage has its place in the world. Maybe you have back issues, and don’t fancy lugging a backpack around. Then a roller bag is definitely the way to go. Mujirushi Ryohin, or Muji in Japanese, translates to “no-brand quality goods.” Muji are masters of minimalism. They specialize in minimalist household goods, clothing and travel accessories. One of my favorite things about Muji is that they have a no-brand or no-logo policy. I’ve been a fan of Muji items for a while now, ever since coming across a Muji store in Tokyo. A lot of our household items are from Muji – our ironing board, bookshelves and shoe trees, just to name a few. As of today, they have a small presence in the United States. They have a flagship store in mid-town NYC, just across the street from the New York Public Library on Fifth Avenue, and a few blocks from Grand Central Station. It’s always worth a visit if you’re in New York. The US online store is at muji.com, but unfortunately it’s clunky and doesn’t show the whole catalog. It isn’t the greatest. They have 6 other stores spread across Manhattan, Brooklyn and New Jersey, a store in Boston, and a couple other stores in California. You can view all Muji retail locations in the US by clicking here. Muji currently makes their hard carry suitcase in 5 sizes, from a tiny 19 Liters, 35 Liters, 62 Liters, 87 Liters and 104 Liters. Just in case you weren’t sure, the Liter sizes don’t refer to weight, they refer to how much stuff you can fit in them. These Muji suitcases (aka trolley) are some of the most under rated and best value spinner luggage you can find today. In the US, all sizes are available in four colors: light grey, beige, navy and black. In Japan and other markets, there are additional colors available: red and aqua blue; and light blue, light pink and ivory for the 19L version only. For storage, both the 19 Liter and 35 Liter can fit inside the 87 Liter. Unfortunately, the 19 Liter CANNOT fit inside the 35 Liter. The 35 Liter also cannot fit inside the 62 Liter. The 62 Liter can fit inside the 104L, but it cannot fit inside the 87 Liter. The 87 Liter cannot fit inside the 104 Liter. Some suitcases can store inside larger suitcases. See above to know what size can store inside each size. In this review, I’m only going to focus on the 2 smallest sizes since they’re the ones I have. But all sizes have similar features and materials, it’s just the capacity that’s different. All bags are made of light weight and highly scratch-resistant polycarbonate on the outer shell, and polyester lining on the inside. All suitcases are spinners, featuring 4-wheels. The wheels are excellent, with a double wheel design that is really quiet (no annoying squeaks!) and can roll smoothly in most surfaces. These Muji spinners also feature a quick and easy one-push stopper that will lock the rear wheels, preventing your bag from rolling away on an incline. This eliminates one of the disadvantages of a 4-wheeled spinner vs a 2-wheeled roller. The 19 Liter version is new to their luggage line-up, while all other sizes are upgrades of the older smaller sizes. Muji updated the lineup in 2017, and added an extra 2 Liters to each bag. The 35 Liter carry-on suitcase is one of the best value carry-on rollers with 4-wheels in the market right now. At an SRP of only $160, this thing is worth every penny. The new 35 Liter carry-on is an upgrade from the previous 33 Liter carry-on suitcase. This new slightly larger version was introduced in 2017 as part of the “Muji-to-go” line-up of luggage, travel accessories and soft goods. The 35 Liter is well within carry-on limits of most airlines, to include regional jets and budget airlines in Asia and Europe. 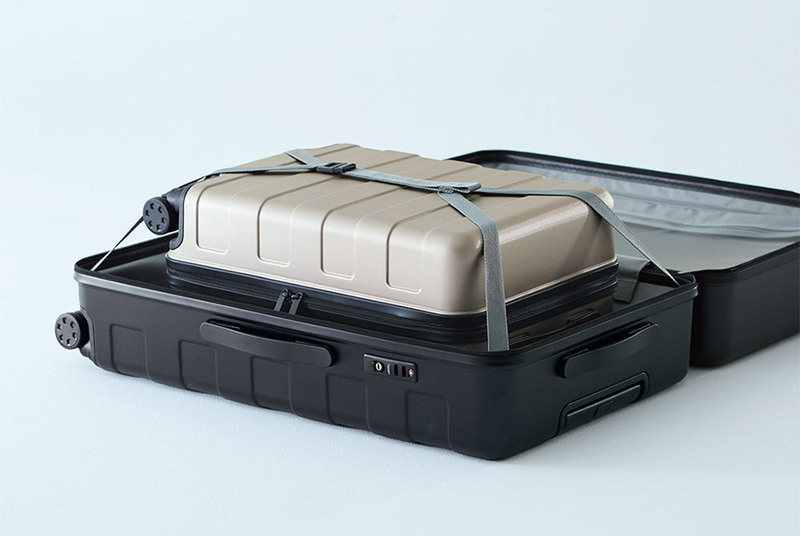 This isn’t a maximum legal carry-on, Muji did not push the dimensions to the limits. Unless you happen to be on a really full flight where the airline forces passengers to gate-check bags, you won’t have any problems with this going over the limit. That said, I have actually used the 35 Liter as checked luggage for over half-a-dozen flights now. Two of them were long haul flights, from NYC’s JFK to the worst airport in the world, and vice-versa. And the bag performed admirably. The wheels are super smooth, no difference from brand new vs 6 months later. More importantly, the bag barely show any scratches. One of the selling points of Muji’s polycarbonate material, aside from their weight-to-strength ratio is their ability to withstand scuffs and scratches. Scratches are a common problem with hard shell luggage but I’m happy to report that Muji’s are pretty good at keeping their clean aesthetic. I’m definitely a believer. Although it is perhaps worth noting that mine is black. Some of the lighter colors may not do as well in hiding scuffs. The Muji 35 Liter suitcase is the sweet-spot of the line-up, in my opinion. Small enough to carry-on, yet it can easily double as a checked bag for the light packers out there. Why not just use this as a carry-on if you’re a light packer? Well, it depends on the airlines you’re flying, or what other gear or bags you’re flying with. For example, in my recent flight with this bag, I used it as a checked luggage, with a small backpack as a carry-on. This was because I was flying a budget airline with a strictly implemented 7kg carry-on + personal item total limit. Even though my backpack was small, I was carrying a lot of camera gear, so I was already at the limit. So I had no choice but to check a separate bag. The 35 Liter was more than large enough for all my clothing, and there was still space left over for the extra knicknacks I purchased on the trip home. One great thing about the 35 Liter is that it isn’t very unwieldy, even when packed full. On the trip home, I was at just over 13kg, but it felt like half that. Even when rolling on the poorly kept carpets of the airport, I had no problems with this trolley. With the telescoping handle fully extended, the 35 Liter suitcase measures 36 inches tall, from the ground. It’s easy to pull, and extremely easy to roll beside you. 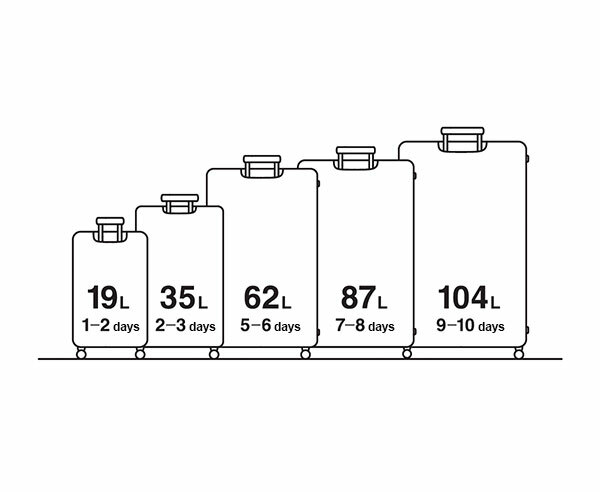 The smaller 19 Liter is new to the lineup and was introduced in 2017 as part of the “Muji-to-Go” line. You’re probably wondering why anyone would need a 19 Liter suitcase? It doesn’t really make much sense does it? Why not just carry a backpack? You’re getting a relatively small carry capacity with the added weight of a roller bag, not really a great trade off, right? Most carry-on backpacks have way more capacity, and weigh significantly less. Most people really only need the 35 Liter. Perfect for checked luggage, yet small enough to carry-on in most flights. So, who is it for? Kids are the obvious first choice. It’s small and easily maneuverable, that they can easily push it around even when carrying their own backpack. But is it just for kids? Well, it turns out its also got special use cases. The 19 Liter roller is actually my wife’s luggage. She’s 5’2″. Specifically, it’s for my wife to use as a carry-on, in addition to a small backpack as a personal item. More specifically, it’s a great carry-on bag with a kid in tow. A tiny roller bag is just easier to pull around especially when you’re dealing with a toddler. Could she carry more with a 30 Liter carry-on backpack that weighs less than the 19L suitcase? Sure. But as anyone who has ever traveled with a baby will tell you, your attention is sometimes pulled a hundred different ways when traveling with a child, you just don’t want to waste mental energy in dealing with your bag. You need something that can be knocked around, yet still be small enough to be easily maneuvered with one hand. With a backpack, you can’t just drop it on the ground without care. You have to make sure the straps don’t get dirtied. You have to put it on the ground with care, since there isn’t a lot of padding. With a rolling hard case, it doesn’t really matter if it takes a dive on the sidewalk, or if falls on its face while rushing through the airport. Yeah, it’s so small that it’s kind of limited to special use cases, but if you’re a short person and are traveling with a child, having a small rolling hard case with lockable wheels may be easier vs dealing with a larger carry-on backpack. With the telescoping handle fully extended, the 19 Liter suitcase measures approximately 34 inches from the ground. This is almost the same height as the 35 Liter fully extended. It’s perfect if you stand 5’6″ or less. Muji products always stand out because of their elegant minimalist designs, and these suitcases are no exception. The lightweight and scratch-resistant polycarbonate shell is way better than your run of the mill ballistic nylon. I’ve checked my 35L suitcase a bunch of times now, and it still looks pretty new. If you’re looking for a suitcase that will easily show battle scars, you’ll have to look elsewhere. These Muji suitcases simply don’t scuff easily. Another great feature of these Muji spinners is a one push lock-unlock button. It’s so well implemented and easy to use, I don’t know why not all spinners have something like this. This is great if you need to park your suitcase on an incline or anywhere you don’t want it rolling away and tipping over. It doesn’t sound like such a useful feature, until you actually use it. It’s great when you need two hands free while you’re standing in a moving train, or when you’re loading other bags into the back of a taxi. One push button to lock/unlock the wheels! An extremely useful and under-rated feature. Also standard is a TSA zipper lock. But Muji does one better compared to most suitcases. 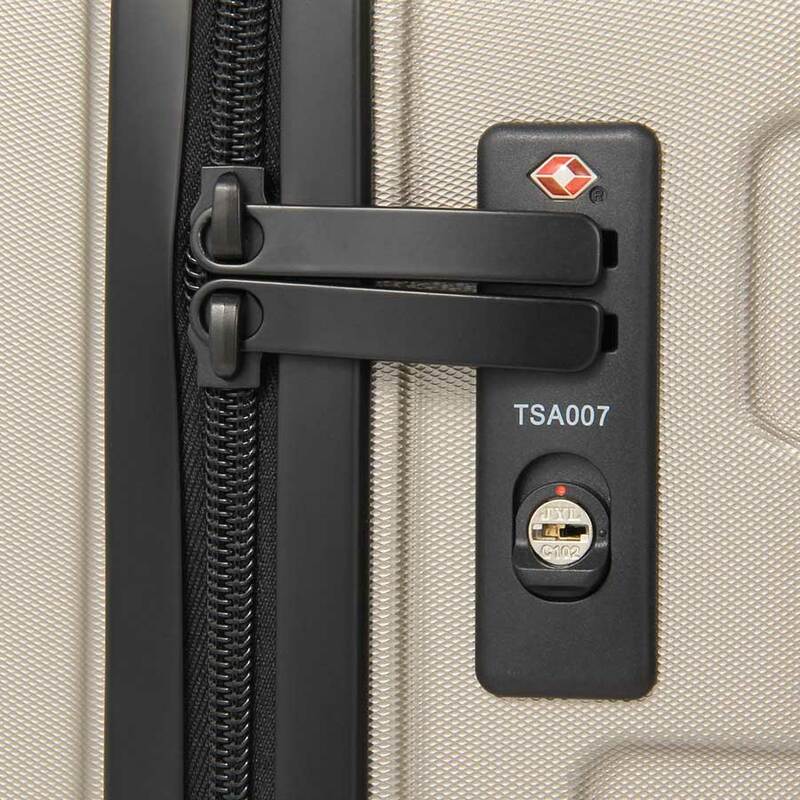 You can stow the zipper pulls into the lock without needing to actually lock it. 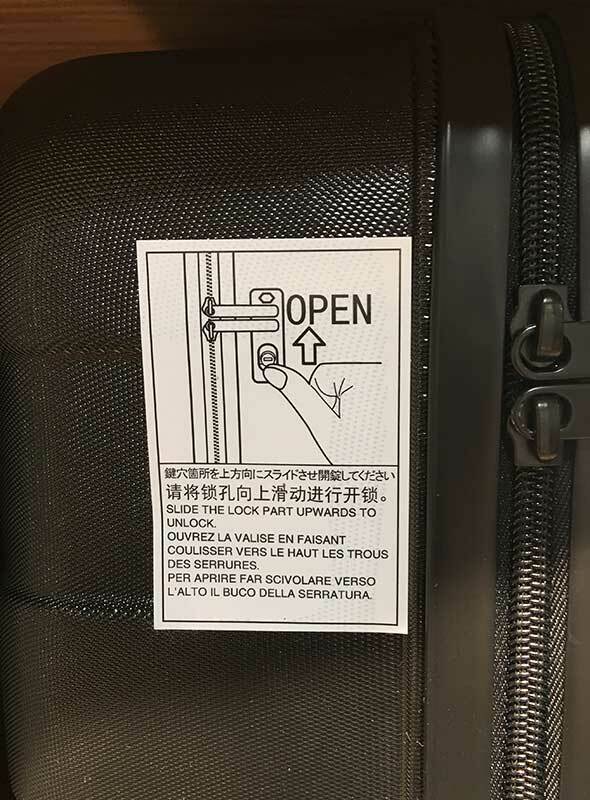 To everyone else, it looks like your suitcase is locked. But you can easily unlock it by simply pushing on a small thumb pad immediately below the key hole (see illustration below). This is great since you won’t need to fiddle with the keys all the time, yet the zipper pulls remain stowed so anyone who checks out your bag assumes it’s locked. Quick and easy. Just push the thumb pad upwards to unlock. No need to fiddle with keys all the time. You only need your keys when you check your suitcase. Here you can see the zippers neatly stowed. You can do this with or without keys. Once you unzip it, the insides are pretty standard. You’ve got two large compartments divided with a nylon flap. There is a large zippered mesh pocket on the divider flap and a compression strap in one compartment (this is the other difference from the older versions – the previous versions had 2 horizontal mesh pockets). That’s it. There are no other pockets in the bottom or near the hinge, like other suitcases. If you’re used to stuffing your socks and underwear into small built-in pockets, you’ll be disappointed. But personally, I prefer using packing cubes for everything, so I much prefer the barebones design of the interior here. Leather is used on the spine to connect the two halves. The top telescoping handle is plastic, with no soft touch materials, but I never found it to be a problem. And I don’t expect a fancy handle at this price. There is a top carry handle just beside the telescoping handle, and there is also a long carry handle just below the TSA lock. There are no handles on the bottom or on the side of the spine. This makes it just a tad harder to grab these bags from the overhead bin or off the luggage carousel if a handle isn’t facing you, but it’s a minor issue. Honestly, I’ve never understood the appeal of ‘smart-luggage’. Why pay extra $$ for a built-in battery pack in your suitcase when you can just grab a high quality Anker battery pack off of Amazon? They’re cheap, high quality and can charge your devices many times over. Not to mention, you’ll potentially run into problems with suitcases with built-on battery packs. American Airlines, Delta and Alaska Airlines have already began banning these suitcases from being checked, citing fire concerns with lithium-ion batteries. This is in line with the old FAA policy against having loose spare lithium-ion batteries in checked baggage. This isn’t a problem if you’re carrying on your smart suitcase, but it can be a hassle when you’re forced to check your bag. Airlines have already confirmed that they aren’t going to remove other bags just so you can carry your smart luggage in, and they won’t check it unless it’s battery free either. Some smart luggage, like the popular Away suitcases make things easier by allowing you to remove the built-in batteries in their carry-on bags, but again, why go through the hassle? Just get an external battery pack from Anker. They’re better quality, much smaller with higher capacity and you can drop them in ANY bag. Even your daily carry bag. Why spend the money on a smart suitcase that is basically the same thing? Most definitely. These Muji spinners are really some of the best bang for the buck suitcases you can get right now. They’re priced well, they look great, they’re built extremely well with high quality materials and they’ve even got some nifty features like the locking wheels and the easy to use zipper pull stowage. The 35 Liter in particular is the sweet spot. Just in case you aren’t familiar with our travel and packing philosophy here at UrbanCarry, we always encourage people to pack light and go with a smaller bag. We’re not fond of maximum sized carry-ons, we almost always prefer something smaller. Going smaller forces you to pack efficiently. A lighter bag = a better trip. Plus, don’t forget small regional jets, budget airlines and strict carry-on limits in Asia, Australia and some parts of Europe. If you’re going to get one, the 35 Liter gets my vote. Small enough to work as a carry-on, and it’s well within the maximum legal carry-on limits that you’ll still have a better chance of not getting gate-checked on a full flight. But it’s also big enough to work as a checked bag in addition to another carry-on if needed. 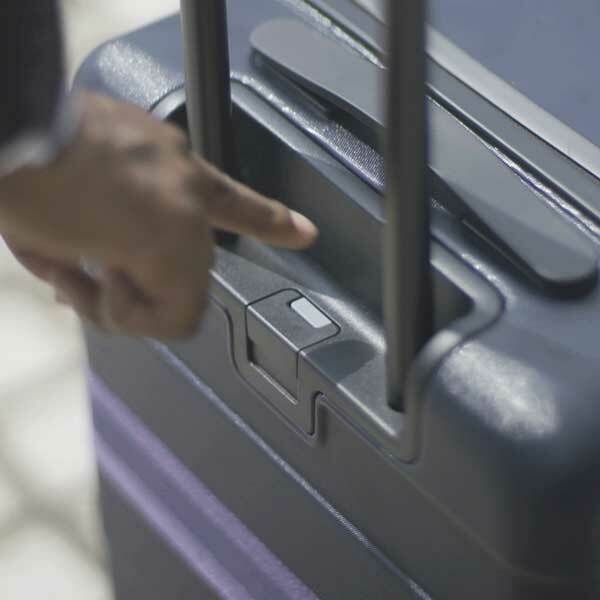 Overall, these new Muji spinner suitcases are hard to beat in terms of price and performance. Like most Muji products, they’re not the most fancy, they aren’t feature packed and they don’t have fancy USB charging ports. But it’s still a well-priced, well-designed and durable piece of luggage with the clean, minimalist look that Muji is famous for. 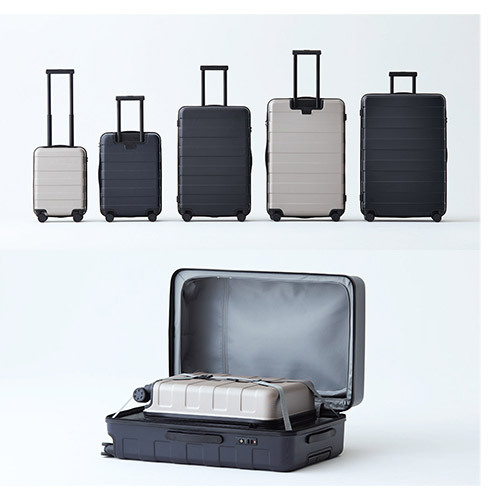 If you’re in the market for a carry-on spinner that looks better than your typical (yawn) Samsonite that you can find at Walmart or Target, you’d be hard pressed to find anything close to the quality of these Muji suitcases, at this price range. Most similar suitcases cost at least $200++ more. I’ve had my eyes on the muni carry-ons and was wondering about their durability. This is the most comprehensive review I’ve read on these. Thanks!! 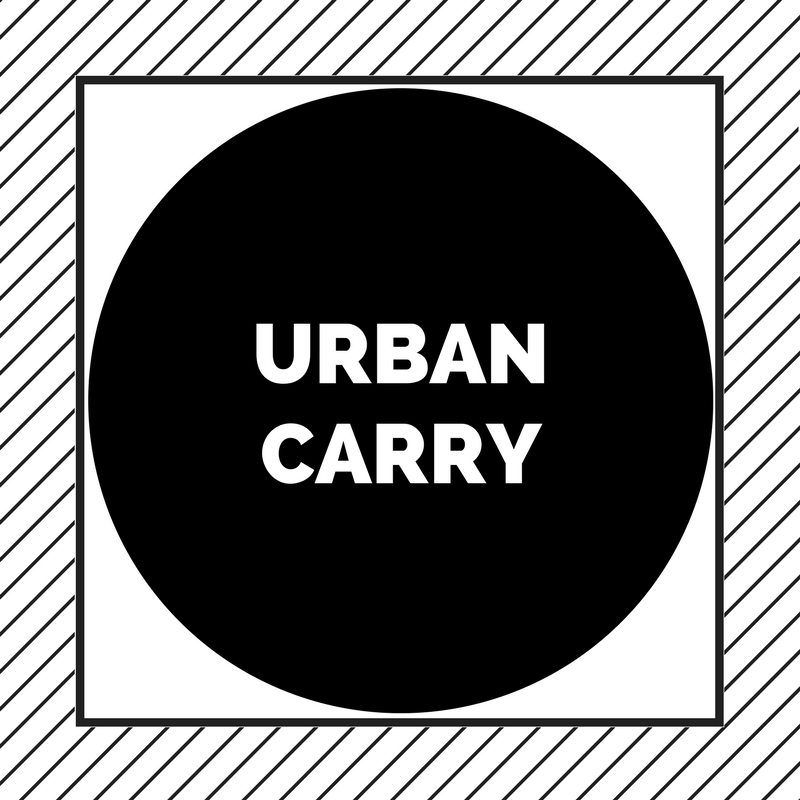 urbancarry.cc is a participant in the Amazon Services LLC Associates Program, an affiliate advertising program designed to provide a means for sites to earn advertising fees by advertising and linking to Amazon.com. This means that we get a small commission on products sold through affiliate links at no extra cost to you.